The application of MAG results in significantly less chloride runoff and pollution than Potassium Chloride, Calcium Chloride and Sodium Chloride. while still maintaining its high performance level. Applicaton Rate ­ -2 -­4 oz evenly per Square Yard. MAG® is safer for use around animals and humans, safer around vegetation, corrodes metal surfaces less, less irritating to the skin, safer on concrete, and environmentally friendlier than other ice melts. MAG® is safer for use around animals and humans. MAG is much less toxic than Calcium Chloride, Potassium Chloride and Sodium Chloride based on data provided by the U.S. Department of Health and Human Services. In fact, a form of MAG is used as a mineral supplement in some farm animal feedstocks. MAG® is less irritating to the skin. 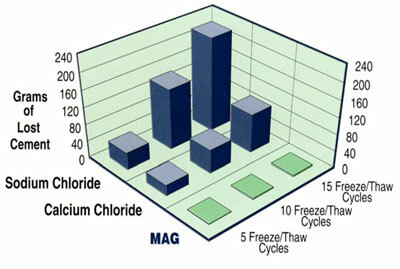 MAG, unlike Calcium Chloride, is not noticeably exothermic (generates heat) when it first comes in contact with moisture. Magnesium Chloride is unlikely to irritate the skin or burn the skin when it contacts moist skin surfaces. MAG® is safer around vegetation. When used as directed, MAG is safer to use around plants and bushes. In fact, Magnesium Chloride is used as an ingredient in some fertilizers. MAG® is safer on concrete. Tests by the Strategic Highway Research Program, Washington D.C.,using 3% solutions (representative dilution of ice melting brines) show that Calcium Chloride caused 26 times and Sodium Chloride caused 63 times the amount of concrete spalling than MAG. MAG® corrodes metal surfaces less. Tests show MAG to be significantly less corrosive than Calcium Chloride and Sodium Chloride on steel, tin and aluminum. MAG® is safer indoors, too. MAG won’t leave a powder residue on household surfaces like floors and carpets unlike most other ice melters.